After the recent earthquakes in Central Italy, the research and historical heritage of the University of Camerino, one of the worlds’ oldest research institutions, is in danger. With your help we can save our history, art, and research. A series of unprecedented earthquakes struck central Italy between October 26th and 30th. On the 26th with 2 hours difference two shocks of Mw = 5.5 and Mw 5.9 caused major destructions between the regions Marche and Umbria. Four days later a third quake – the strongest yet (Mw = 6.5) – laid waste to the town’s already weakened structures. Camerino, the most important medioeval town located nearby the earthquake epicenter suffered an unimaginable devastation. The town is the seat of the University of Camerino (Unicam), which is among the oldest universities in the world. Founded in 1336, and officially recognized by Pope Benedict XII, Unicam has been widely regarded over its long and distinguished history as a beacon of academic thought. Today, it continues to build on this distinguished history, and on a tradition of research excellence, with a commitment to outreach and career development. Following this dramatic series of quakes the research infrastructures and the historical buildings of the University have been severely damaged; this priceless heritage is now under threat. To give up this precious institution would be a terrible loss not only to the Italian university system, but to the academic world as a whole. “The University of Camerino is in dire need. We have to rebuild part of our research infrastructures and restructure the historical buildings that for many centuries hosted the University. The Ducal Palace, the Sala della Muta and the Sala degli Stemmi, the symbols of our history have been severely damaged” stated Flavio Corradini, Rector of the University. “The restoration of these rooms, the reorganization of university teaching activities and research is our priority. We cannot do it without help. My hope is that other Universities, Research Institutions, Foundations will help us in this monumental project. Imagine if each of these Institution will donate something like $ 10.000 or less, we will raise enough to bring back to life Unicam. Small donations from private citizens and philanthropist will also be of priceless help” continued Flavio Corradini. “For more than 700 years, as the University of Camerino, our university has honored the town of Camerino; however, from now on, in an important sense, the University will no longer belong to Camerino. It will belong to the world. For this marks a transformation, a new relationship with the world, in which Unicam joins together with all the universities, research institutions and benefactors who contribute to our reconstruction, revitalization, and the preservation of our history. 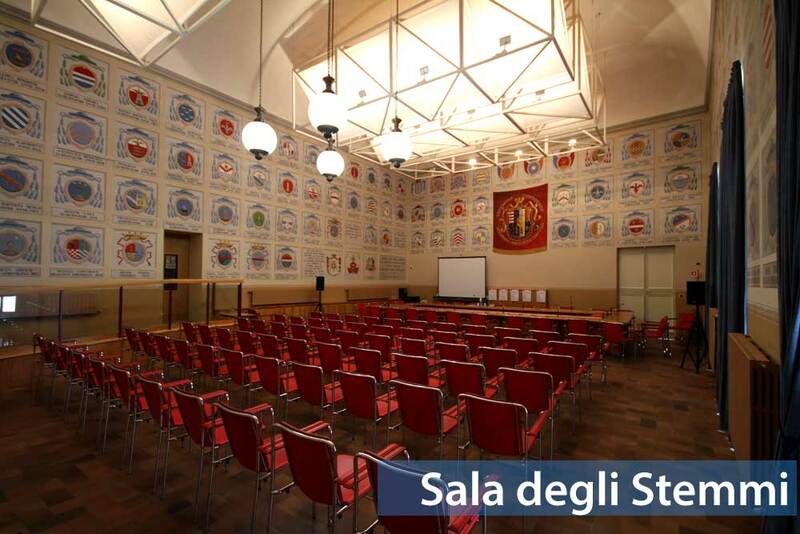 In exchange we would be honored to dedicate to our benefactors a commemorative room with walls decorated with their symbols and names, as it is now for the Sala degli Stemmi covered by canvas depicting the history of our University” stated the Rector again. Unicam was funded in the XIV century to host humanities but over the last two hundreds years expanded significantly towards scientific disciplines. In Unicam there are now research team working in the field of life science, mathematics, physics, computer science, chemistry, earth science and others. It participates to international research programs of outstanding significance related to climate changes, detection of gravitational waves, early phase discovery of innovative medications, green economy only to mention few. It is a paradox that research teams at Unicam Earth Science Department are major experts in studying the cartography and the faults of the Appenine Moutains, the seismic even associated to the slip of these faults is now placing at risk this research in which University plays a leading position at global level. “I was in Camerino for a Conference when this dramatic wave of quakes hit the town. It was a terrible experience that I will remember for the rest of my life. I was probably the last one to visit the beautiful panting of Tiepolo a half an hour before the quake arrived. I heard that the painting has been saved. We need to do something to help the University of Camerino to rebuild its infrastructures." The Sala degli Stemmi (Hall of Coats of Arms), named for its ornately decorated walls which through a long sequence of coats of arms tells the history of the city and of its territory. This is one of the most important historic halls of the ancient university. 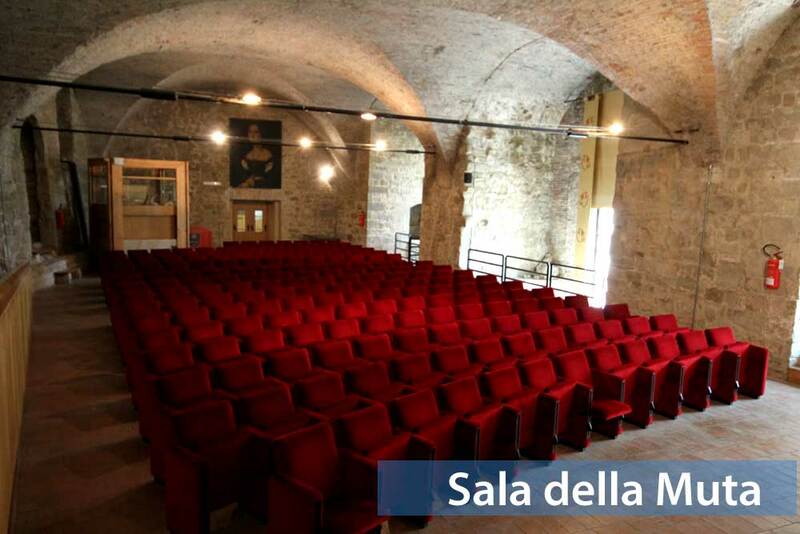 The conference room, also used for meetings of the administrative bodies of the University is located in the oldest part of the Ducal Palace built between late 1200 and early 1300. The Sala della Muta (The Hall of the Muta), named for its links to the famous potrait 'La Muta' by Raphael, is the largest conference room in the Palazzo Ducale. Set in the ancient heart of the palace, this room dates back to the fourteenth and fifteenth centuries. It is built from sandstone blocks with a brick vaulted ceiling, representing an impressive feat of fifteenth century engineering and overlooks the trees of the Botanical Gardens below founded in the early nineteenth century. The hall is the home to many events and important celebrations related not only to academia, but also to the cultural life of the town and its territory. The Ducal Palace, seat of the University Rectorate of the School of Law, of the Juridical Library, and many administrative offices, is one of the most important Renaissance buildings in central Italy. It was created in the late 15th century by Giulio Cesare Da Varano, lord of Camerino. 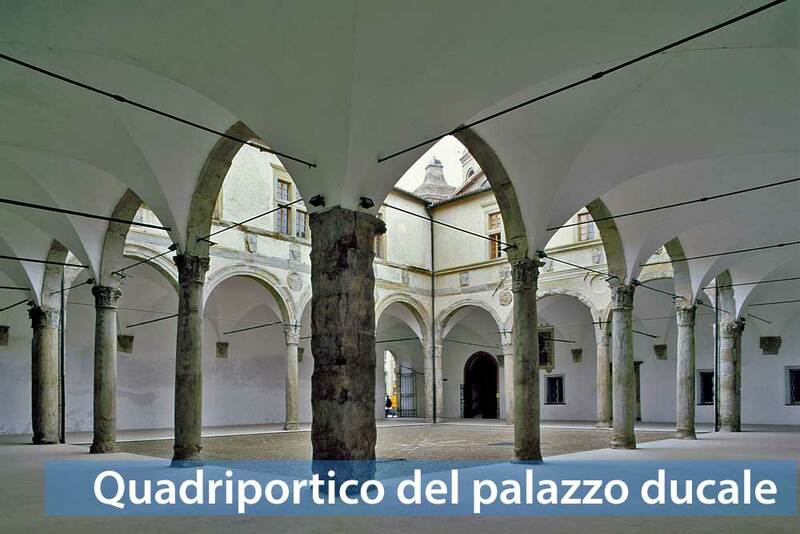 The large, aerial, four-sided courtyard represents the highest expression of the architectural style of the whole Palace. Adorned with elegant and classic columns, each with a capital differently decorated, the design is attributed to Baccio Pantelli, one of the most celebrated Florentine architects. Looking inward into the courtyard, the walls are decorated with the coats of arms of Giulio Cesare da Varano and his wife, Giovanna Malatesta da Rimini.